Discovering Discrete Dynamical Systems is a mathematics textbook designed for use in a student-led, inquiry-based course for advanced mathematics majors. Fourteen modules each with an opening exploration, a short exposition and related exercises, and a concluding project guide students to self-discovery on topics such as fixed points and their classifications, chaos and fractals, Julia and Mandelbrot sets in the complex plane, and symbolic dynamics. Topics have been carefully chosen as a means for developing student persistence and skill in exploration, conjecture, and generalization while at the same time providing a coherent introduction to the fundamentals of discrete dynamical systems. This book is written for undergraduate students with the prerequisites for a first analysis course, and it can easily be used by any faculty member in a mathematics department, regardless of area of expertise. Each module starts with an exploration in which the students are asked an open-ended question. This allows the students to make discoveries which lead them to formulate the questions that will be addressed in the exposition and exercises of the module. The exposition is brief and has been written with the intent that a student who has taken, or is ready to take, a course in analysis can read the material independently. The exposition concludes with exercises which have been designed to both illustrate and explore in more depth the ideas covered in the exposition. Each module concludes with a project in which students bring the ideas from the module to bear on a more challenging or in-depth problem. A section entitled "To the Instructor" includes suggestions on how to structure a course in order to realize the inquiry-based intent of the book. The book has also been used successfully as the basis for an independent study course and as a supplementary text for an analysis course with traditional content. This slim purple volume got this reviewer excited the minute he opened it. Johnson (Swarthmore College), Madden (California State Univ., Bakersfield), and Sahin (Wright State Univ.) 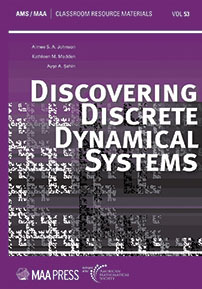 have developed an innovative introduction to the analysis of discrete dynamical systems. This reviewer feels inspired to get a student or two, delve into the book in greater detail, and experience discovering the subject again.